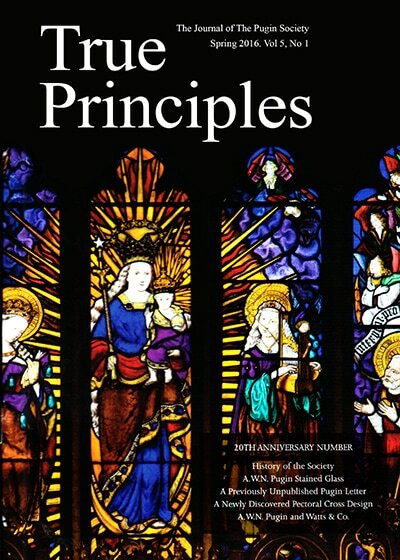 True Principles, the Pugin Society Journal, is named after one of Augustus Pugin's greatest works - The True Principles of Pointed or Christian Architecture (1841) - in which he outlines his architectural theories, showing firmly that it is in the Gothic style that these theories can best be exemplified. True Principles appears once a year, in the summer. It is a well presented and attractively illustrated journal, filled with interesting articles and features on many Pugin-related subjects, by a whole range of writers. We are anxious to encourage debate on Pugin topics and submissions are welcome. It is edited by John Elliott. St Augustine's Abbey, Ramsgate - Ever since our Apostle's advent there in A.D. 597, the historic Isle of Thanet has been associated with the black-robed sons of St. Benedict and today St Augustine's Abbey at Ramsgate is of special interest, both past and present. For its Minster is "Pugin's gem" as well as his last resting place while the monastery itself is a spiritual restoration of Canterbury's famous Benedictine Abbey. Lecture given in Ramsgate in 1996 [published separately from True Principles]. 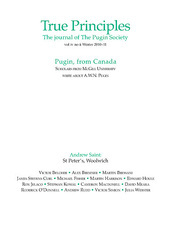 Pugin on the Internet - Some most interesting statistics are emerging from Victoria and Mike Farrow's acclaimed Pugin web site — up to three hundred people a week are looking at this site (WWW. HUBCOM.COM/PUGIN), and these three hundred people are viewing ten pages of text or pictures each, approximately. St John the Baptist, Melton Mowbray - Graham Hulme and Brian Buchanan discuss a Leicestershire Church with interesting Pugin links. "Prest D'accomplir": Pugin and the Earl of Shrewsbury - A unique relationship discussed by Michael Fisher. Forget the Millennium, the Society is looking towards 2002 - Chairman Nick Dermott reports. Some Stray Notes on Art - John Hardman Powell, 1827-1895, is known to many Pugin enthusiasts and scholars both for his apprenticeship, as it were, to A.W.N. 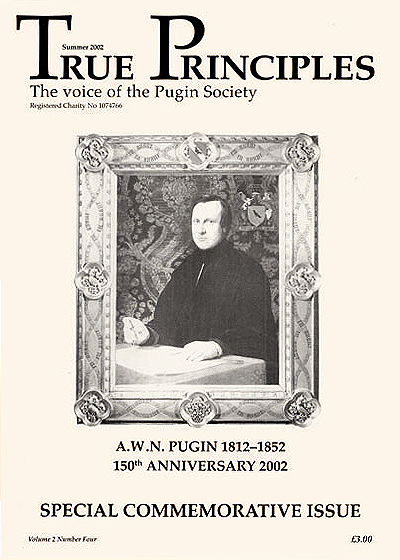 Pugin, and for the fact that he married Pugin's daughter, Anne, in 1850. His affectionate and sympathetic portrayal of A.W.N.P., to whom he always acknowledged his great debt — 'Pugin in his home ' — has also become familiar to many. Less often discovered is Some Stray Notes on Art, published in 1889, his lectures to students at the Birmingham School of Art. Powell became chief designer for Hardman & Co in Birmingham after Pugin's death in 1852, producing, over a considerable period of time, beautiful stained glass, jewellery and metalwork; he therefore would have had much of value to impart to students. Whilst he had securely ingested all that his master had taught him, he gradually evolved an approach of his own to design, lighter and more attenuated than that of Pugin perhaps; in a sense less 'masculine', but attractively graceful and flowing. The Grange: Current State of Play - Pugin Society Chairman Nick Dermott gives us a resume of the evolution of The Grange and considers the Landmark Trust's proposals for the alteration and refurbishment of the building and their current planning application to Thanet District Council. Sampson Kempthorne and the Gothic Revival in New Zealand - John Butler and Renatus Kempthorne tell the interesting story of a sometimes unlucky architect-emigrant. 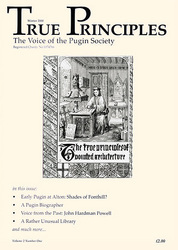 Edward Pugin and the English College in Rome - Carol Richardson describes E.W.Pugin's not altogether happy connection with the building of a new church. Some Stray Notes on Art - In part one of the second of John Hardman Powell's lectures to students at Birmingham School of Art he discusses what he calls 'Art Imitative'. He covers much ground, revealing some interesting priorities en route. 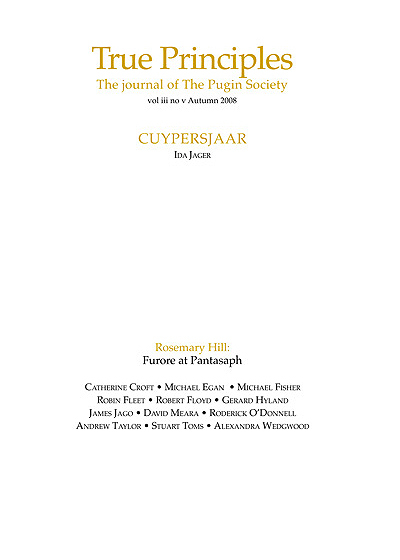 There are a number of points here which we felt might need further elucidation, so endnotes have been added, and the text has been slightly reduced in length. Punctuation, etc, are Powell's own. Thomas Larkins Walker: The Chamberlaine Almshouses, Bedworth, Warwickshire - A promising early work by a pupil of Auguste Charles Pugin attracts the attention of Rosemary Hill. Some Stray Notes on Art - In this issue we publish part two of John Hardman Powell's second lecture, 'Art Imitative', and join him as he gradually climbs with us — to use his own metaphor — from the foothills of art and craft towards the high peaks, where 'the air is fuller of noble and ascetic thought'. As usual, we would remind readers that grammar, punctuation and spelling are J.H.P's own, and we have also added a few endnotes. Going Full Tilt - Alexandra Wedgwood discusses The Collected Letters of A.W.N. Pugin, volume I, 1830-1842, edited by Margaret Belcher, Oxford University Press, 2001, ISBN 0 19817391 1. London: Pugin and Comper - James Jago recalls a memorable day. Ramsgate Cemetery — A Furious Footnote - Gavin Stamp on contentious matters in Edward Pugin's Ramsgate. Pugin's Tabernacle in Southwark Cathedral - Alexandra Wedgwood investigates the history of an outstanding and much-debated Pugin item. Ambonoclasm Redeemed - 'Some cleave, some pierce, some shout, and with one great crash it totters and falls' as Pugin wrote of a much earlier Rood screen. Happily, the consequences for his great screen at St Chad's, Birmingham have not been so dire – although it was a near thing – as Gavin Stamp's account describes. A Pugin Drawing? - An unusual drawing prompts Rosemary Hill to ponder questions of attribution and to seek comment. The pen and ink drawing of two sections through a chantry chapel that appears here as Fig 1 has, so far as I am aware, never been published before. It is unsigned, there is no watermark in the paper and there was no clue to its origins when it was brought to my attention some eighteen months ago beyond a pencilled note in an unidentified hand that read, laconically enough, 'by Pugin'. Is it? If so, when might it have been made and for what purpose? 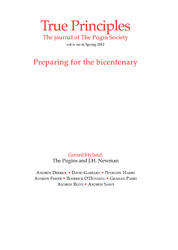 August Martin, 'the only man that makes Gothic living' - Antoine Jacobs recounts the life of German Revivalist artist, August Martin, and solves a long-standing mystery in the Pugin Chantry, Ramsgate, a chantry particularly significant to us in this issue. 'The Good Style at the Antipodes' - Margaret Belcher explains how Pugin and his ideals influenced architecture and society in New Zealand. Hardman's Stained Glass and the Transfer from Pugin to Powell - Stanley Shepherd looks at a period of transition at the firm of Hardman & Co.
St Peter's Chapel, Alton Towers - How Pugin waved a magic wand over the Earl of Shrewsbury's early nineteenth-century Gothick chapel in Staffordshire is the subject of Michael Fisher's article for this issue of True Principles. 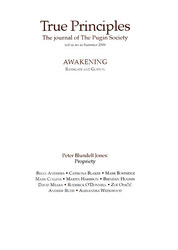 It All Melts Away: AWN Pugin in Oxford - Timothy Brittain- Catlin looks at some A.W.N.P. proposals in Oxford, and wonders just how much of a functionalist Pugin really was. The Right Thing at the Antipodes - Brian Andrews considers the approach to Puginian Gothic in Australia, finally focussing on an outstandingly 'pure' example of Pugin's work in Tasmania. 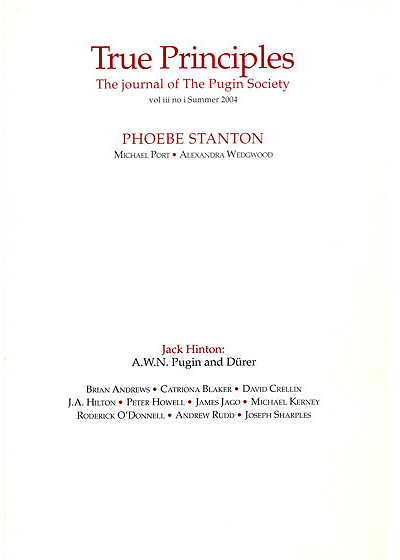 As I Was Going To St Ives - A report by John Purkis on the curious and somewhat puzzling history of an A.W.Pugin church, which began its life in Cambridge. Comment from members who know this church, or who intend to go and see it, would be welcome. 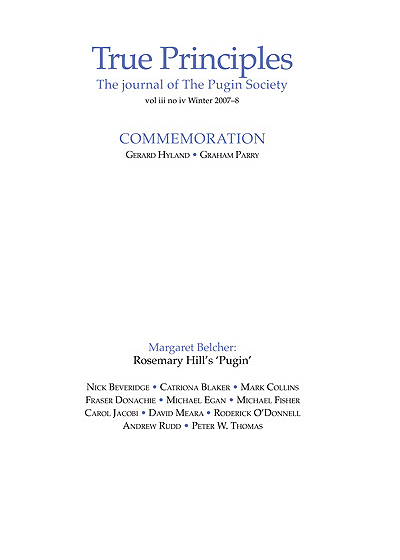 The Pugin Society in Catholic and Gothic Brugge: 25th October 2001 - Report by John Irving on the Society's first foray to the continent. 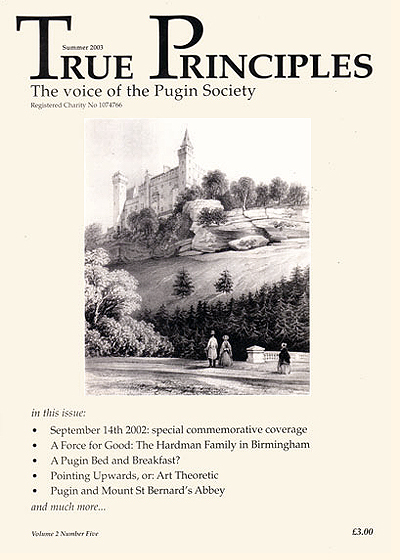 Pugin Commemorations in the Midlands - Michael Fisher brings members news of the multifarious happenings during 2002 in Staffordshire and Birmingham. Pugin in the Antipodes - and we went too! - David Houle, husband of our President Sarah Houle, Pugin's great-great-granddaughter, reports on the epic visit down under, in Part One of our Australian coverage. Ramsgate Remembers - An account from the Pugin heartlands by your Thanet reporter. Some Stray Notes On Art - In this article we finally bid a regretful goodbye to John Hardman Powell, who now leads his students on an exciting and inspiring climb to the very summit of their studies ‚ 'Art Theoretic'. As before, the text has been somewhat reduced in length, and punctuation and spelling, etc, are Powell's own. A Forgotten Episode in the History of St Augustine's, Ramsgate - Peter Howell helps to fill in what was perhaps a grey area in our knowledge of these key buildings. The Hardman Legacy - Sister Barbara Jeffery recounts the life and good deeds in Birmingham of members of the Hardman family. 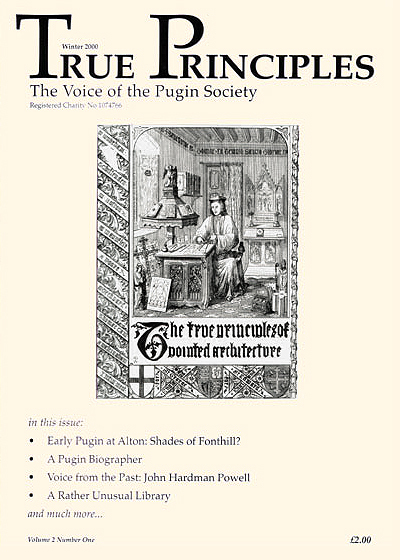 Pugin: A Godly Man? - Pugin? A saint? Following on from his introductory piece in our last True Principles, Jim Thunder makes out an impassioned case in defence of his great-great- grandfather's perhaps unconventional, yet no less convincing, credentials for possible canonization. Note: All references, unless as numbered below, are from J.H. Powell, Pugin in his home, 1889, edited by Alexandra Wedgwood and republished in Architectural History, vol. 31, 1988, reprinted in 1994. A Pugin Link with New Zealand‚ The Benedictine Bishop - Nick Beveridge closes the Gothic gap between Ramsgate and Auckland, in an unexpected and interesting manner. Scarisbrick Hall - A recently discovered series of nineteenth-century photographs sheds fresh light on the complicated history of Scarisbrick Hall, Lancashire, a house on which both A.W.N. and E.W.W. Pugin worked. Rosemary Hill discusses a selection of the pictures, published here for the first time. They are albumen prints of c1872‚3. The photographer's identity is, at present, unknown. For information regarding the present condition of the Hall, see 'Buildings at Risk', on page 41. Some Little-Known Pugin Houses - Reportage from Timothy Brittain-Catlin keeps us au fait with some of the latest Pugin discoveries. The Significance of Architectural Style at Mount St Bernard Abbey - Brian Andrews describes the reasons behind Pugin's approach to design at this most important Leicestershire Monastery. A.W.N. Pugin and Durer: print collecting and inspiration - by Jack Hinton. Some sources of A.W.N. Pugin's chalice designs - by Brian Andrews. E.W. Pugin and the Grange: some reflections - by Catriona Blaker. The Pugin Society was one of the successful appellants (June 2003) against the proposal to dismantle the high altar in Henley church. Roderick O'Donnell was member of the Diocese of Birmingham Historic Churches Committee (2000-3) and of the Committee of the Pugin Society (2000-3). Seel's Building, Church Street, Liverpool - by Joseph Sharples. St Joseph's, Ansdell - by James Jago. 'So very Anglo-Saxon': cisalpines, goths, and Anglo-Saxon - by J.A. Hilton. Gothic horror versus gothic revival: Protestant visions of Roman Catholic society - by Andrew Rudd. A.W.N. Pugin and William Warrington at Oscott - by Alexandra Wedgwood. Abney Hall, Cheshire and the Great Sideboard Mystery - by Michael Fisher. 'I don't think it much matters who is a bishop': A.W.N. 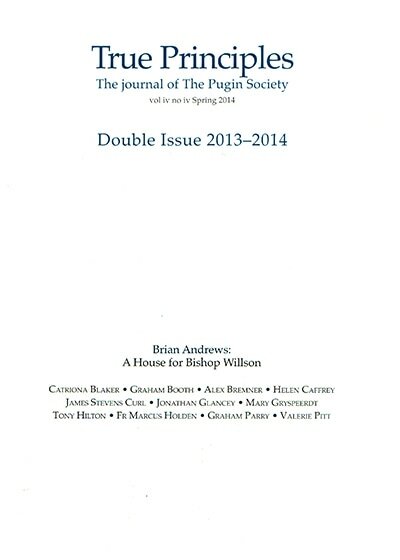 Pugin and the bishops - by David Meara. At the conclusion of the annual general meeting of the Pugin Society in October 2004, Mrs Elaine Griffiths spoke about progress with the Pugin Centre in the shell of Gorton Monastery. A questioner asked how E.W. Pugin became involved in the building of the friary and church in the 1860s. Pulling out a few stops: E.W. 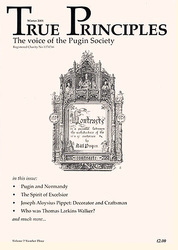 Pugin and organ cases - by Catriona Blaker. 'A pleasing old-time appearance': P.P. Pugin and St Francis Xavier's Cathedral, Adelaide - by Brian Andrews. Pugin, James Mabey, and the architectural models of the Palace of Westminster - by Mark Collins. 'From a Georgian monstrosity into a Constantinopolitan basilica' ‚ and back again? : the current treatment of Victorian alterations to Georgian churches - by Peter Howell. A.W.N. 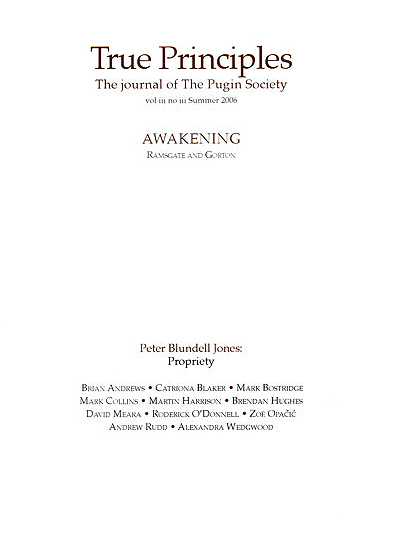 Pugin's concept of 'propriety' - and what might lie behind it - by Peter Blundell Jones. 'I will write and exhort and denounce': A.W.N. Pugin and An earnest address, on the establishment of the hierarchy (1851) - by David Meara. 'To revive, not invent'! : A.W.N. Pugin and conservation at the Palace of Westminster - by Mark Collins. The Church of St. Francis of Assisi, (1866-1885), Gorton, Manchester - by Roderick O'Donnell. Aspects of Hardman's Glass Studio practice in the late 1860s - by Brian Andrews. Sir Walter Scott and the Pugins: some reflections - by Catriona Blaker. Burton Manor: the Staffordshire 'Grange' - by Michael Fisher. God's Architect: a review - by Margaret Belcher. Pugin remembered: then and now - by Graham Parry. The E.W. 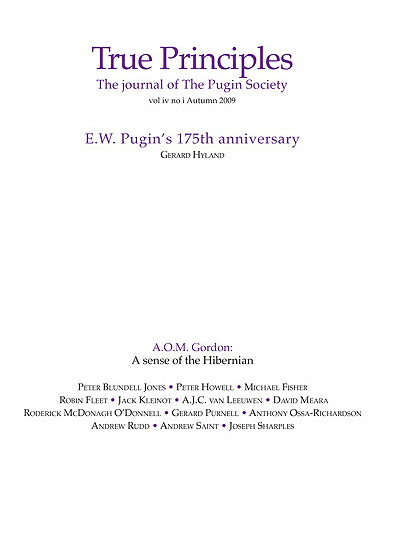 Pugin gazetteer - by Gerard Hyland. Gothic identity and inheritance in the year of Contrasts: John Joseph Scoles, the Jesuits and Saint Ignatius, Preston (1833-6) - by James Jago. A.W.N. Pugin and Viscount Feilding - by Rosemary Hill. E.W. Pugin's junior seminary at Ushaw (1857-9) and H.W. Brewer's birdseye view - by Roderick O'Donnell. 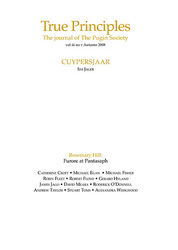 Cuypers: the middle ages in the nineteenth century - Ida Jager. The E.W. Pugin gazetteer: part 2 - by Gerard Hyland. A sense of the Hibernian: Irish identity in the works of A.W.N. Pugin and E.W. 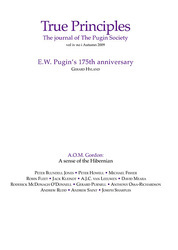 Pugin - by A.O.M. Gordon. The collected letters of A.W.N. 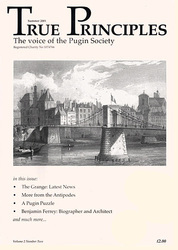 Pugin, vol3, 1846-1848, edited by Margaret Belcher - by Timothy Brittain-Catlin. The E.W. 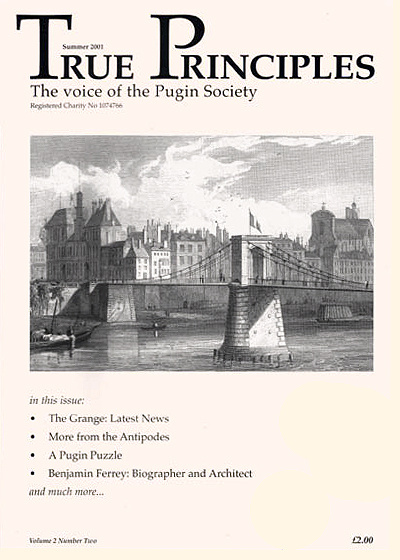 Pugin gazetteer: part 3 - by Gerard Hyland. The Pugins in Woolwich - by Andrew Saint. Remedies external and visible: Pugin's health and Pugin's Gothic - by Martin Bressani and Cameron Macdonell. A.W. N. Pugin's St Marie's Grange - by Edward Houle. Reason and faith: A.W.N. 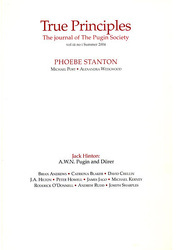 Pugin's apprehension of the mysteries - by Ron Jelaco. Transcending rules: A.W.N. Pugin's St Giles' at Cheadle - by Stephan Kowal. The baptism of British government: A.W.N. Pugin's Catholic hand in the New Houses of Parliament - by Victor Simion. A.W.N. Pugin's Grange at Ramsgate: the moral Catholic house - by Julia Webster. The monument to Lieutenant William Fisher in Salisbury cathedral, Wiltshire - by David Meara. 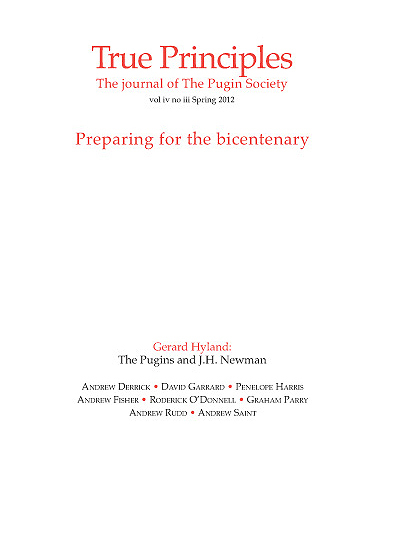 The Pugins, Newman, and the Tridentine liturgical rubrics - by Gerard Hyland. An E.W. Pugin altar in Dulwich - by Andrew Derrick. The 'Fire Place in Great Hall Belmont', 1867: an E.W. Pugin proposal for Belmont House? - by Roderick O'Donnell. J.A. Hansom and E.W. Pugin at St Wilfred, Ripon: a division of labour? - by Penelope Harris. A House for Bishop Willson - by Brian Andrews. Faith, Penitence, and Charity: Pugin, Myers and Sibthorp at St. Anne’s Bedehouses, Lincoln - by Helen Caffrey. Alfred Luck - by Catriona Blaker. Pugin’s Heraldic Revival - by J. A. Hilton. 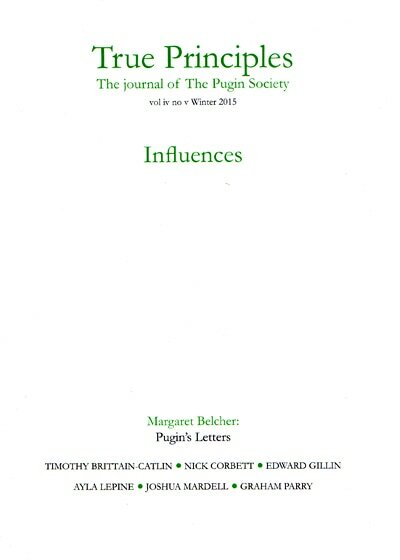 ‘a sort of alladin’: Pugin’s Letters - by Margaret Belcher. Gothic fantastic: Parliament, Pugin, and the architecture of science - by Edward Gillin. Anglo-American modern Gothic: A.W.N. 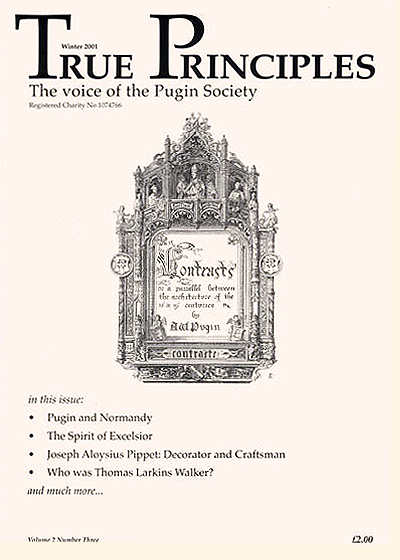 Pugin’s impact of Ralph Adams Cram - by Ayla Lepine. The Gothic Revival in Lancashire - by Graham Parry. Leadership of place - by Nick Corbett. 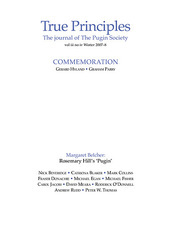 The Pugin Society, 1995-2015 - by Catriona Blaker. ‘My Dear Mrs. Hibbert’ - by Margaret Belcher. Another Pugin Discovery - by Nick Beveridge. A. W. N. Pugin and Watts & Co. - by D. J. Gazeley. Scott’s Model - by Margaret Belcher.